Is the Instant Pot for you? 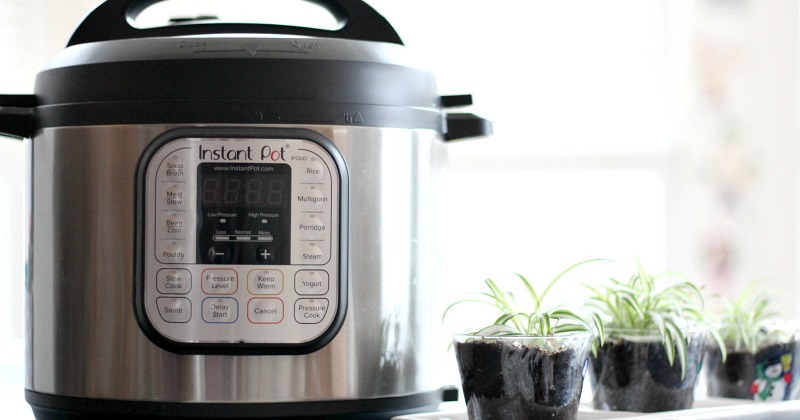 Review Instant Pot's best uses and the one thing that might make you think twice. When my mother-in-law asked me what I wanted for Christmas, I didn't hesitate. "An Instant Pot." I told her. "Honestly, I'm not even sure. But everyone says they are amazing." It seemed like everyone who had taken the time to review the Instant Pot seemed to rave about it, and I wanted to check it out. I am so glad that my mother in law gave me one for Christmas, because it has totally revolutionized meal time in our house. This isn't another review for the Instant Pot. Instead, I'm going to tell you 5 times that you will absolutely love your Instant Pot... and the one time you most definitely will not. If you're a total newbie like I was, here's the Instant Pot in a nutshell. Instant Pot calls itself a "pressure cooker, slow cooker, rice cooker, yogurt maker, sauté/searing pan, steamer and warming pot all in one convenient small electric appliance." Sounds pretty awesome, right? I'm not one of those people who loves to cook. But I'm committed to feeding my family healthy, homemade meals. For me to actually want to sing the praises of a kitchen appliance it needs to make mealtimes easy, and be able to save me from ordering takeout when I've had a meal planning fail. The Instant Pot does this and so much more. You probably know that it cooks quickly, and you can get meals on the table much faster when you use it. But is that the only reason to love it? Nope. There are few times when the Instant Pot will make you declare your undying love - and it's not all about speed. Did you throw out your crock pot in a fit of grief after watching This Is Us? Or are you just tired of everything tasting the same? Don't get me wrong, I have been a big crock pot fan for years. The crock pot was the only way I could make dinner some nights when I had twin babies and I could just throw the ingredients in, turn it on, and be done. But lately, it feels like everything we make in our slow cooker is a one dish casserole kind of thing. All the ingredients end up mixed together which is not ideal with kids who can be particular about their food (you know what I mean... "Mom! There's a piece of something green in this!"). The Instant Pot allows for much more versatility while still letting you have the one pot, "set it and forget it" ease. Seriously, the other night I made this BBQ Chicken & Sweet Potatoes and it came out perfect. I served the sweet potatoes mashed on the side and my family gobbled it up. Plus, you can still make your favorite crock pot recipes using the slow cook feature on your Instant Pot. One appliance to do the work of two. Genius. Even Jack would approve. This is where my careful meal planning often goes awry. I like to buy meat in bulk when it's on sale, portion it, and freeze it. Then I forget to take it out of the freezer when I'm planning to use it the next day. Epic fail. I know some people say you can put frozen meat in the crock pot, and while it technically will work, it's not a great idea for food safety reasons. You can read more about why here. But with the Instant Pot? No problem. Because of the high heat and fast cooking time, you do not need to worry about defrosting your meat (or anything else) before cooking. It is a total life saver when you realize at 5:00pm that your chicken is still frozen solid. Read some tips on cooking frozen meat in the Instant Pot here. Homemade macaroni and cheese or spaghetti with meatballs are staples in our house. But with two active boys and two dogs running around, babysitting a huge pot of boiling water then carrying it over to the sink to drain is not my favorite thing to do. Problem solved thanks to the Instant Pot. I didn't actually think that pasta would turn out when I first tried it in the Instant Pot. I literally had the phone in my hand ready to order pizza as I opened the top for the first time. But I was so wrong. Pasta dishes in the Instant Pot are super easy, fast, and turn out awesome. No more watching for water to boil, no more draining, just yummy comfort food in minutes. Our family's favorite Instant Pot pasta meals: Mac & Cheese and Pasta with Meatballs. There are few things that make mom life easier than having healthy breakfast, lunch, and snacks prepared ahead of time. The Instant Pot is your best friend when it comes to this! 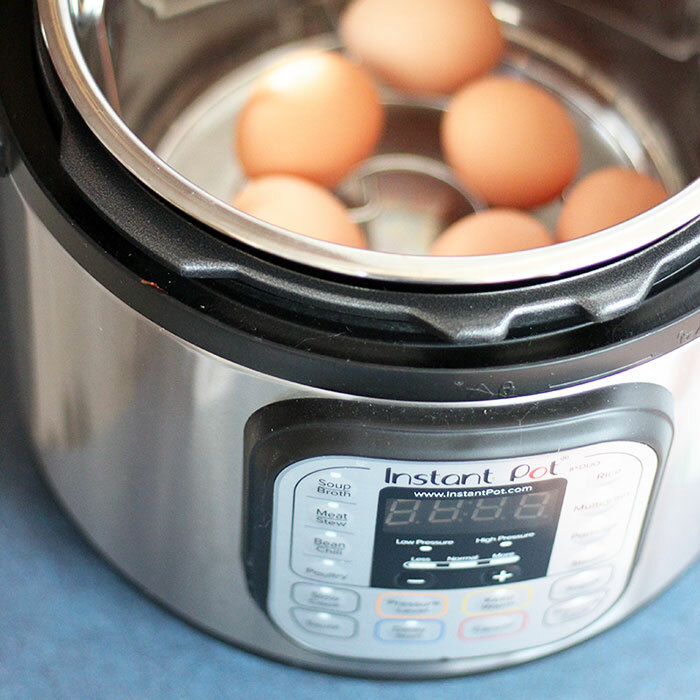 We love hard boiled eggs, and making them in the Instant Pot is a breeze. It's actually the first thing that I cooked, and I do it every week now. You can see how easy it is here. You can also make family favorites like applesauce, yogurt, oats, shredded meat for salads, rice and grains... pretty much anything that you'd like to have on hand to make your daily life easier. Find all my favorite Instant Pot recipes here. Does anyone actually ever want to wash lots of pots and pans? With the Instant Pot, you don't have to. Unlike a crock pot, there's a sauté feature to let you carmelize onions or brown meat right in the same pot where you'll make the rest of your meal. You can truly do everything in one pot, without dirtying a bunch of extra pans. And the inner pot is dishwasher safe, so you can just toss it in and go about your business. As much as I depend on the Instant Pot now, I have to be honest. It wasn't love at first sight. Instant Pot anxiety is real, and I had it. All I could think about was the story of when a pressure cooker exploded spaghetti sauce all over my grandma's kitchen. And there are so many buttons! Don't be surprised if you don't love your Instant Pot when you first open the box. The good news is that there is nothing to be afraid of, as long as you read and follow the instructions thoroughly. Don't wait until it's 5:00pm and you have a meal to get on the table. Take the time to read the manual and practice a few easy recipes first. 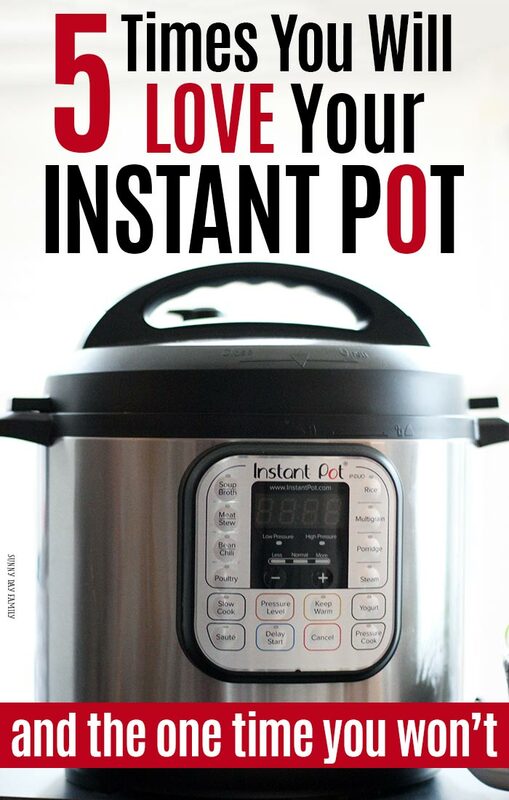 In no time, you'll feel more comfortable and ready to rock your Instant Pot for everything! Get some quick Instant Pot safety tips here (not a replacement for reading the instructions!). Ready to give it a try? Check out the latest price on the 6 quart Instant Pot here!